Pinchos? You might know them as “kabobs.” Meat skewered on a stick, then grilled, goes by the name pinchos throughout Latin America. When Jose Luis Aviles Medina was growing up in Puerto Rico, street vendors sold pinchos. “My family did that,” he says. “ It’s a family thing.” In 1998 he came to Charlotte following a cousin. Almost immediately he began grilling pinchos outside the city’s first Latino nightclubs. It’s simple food. Chicken, or sometimes pork, is skewered in wooden sticks, then slathered with barbecue sauce or hot sauce. 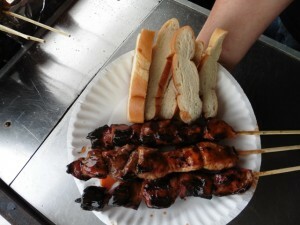 Medina cooks on a grill covered with foil, then finishes each pincho (the word means “skewer”) with flame. Rounds of chewy bread, an approximation of the pressed Cuban loaves popular with street vendors in Puerto Rico, fill out the paper plate. Medina’s black trailer is his calling card. A friend painted the wild murals — a Puerto Rican flag over a stylized Charlotte skyline with “Pinchos el Bori” in blue gothic letters. “Bori” is a proud nickname for Puerto Ricans, much like Tar Heel for North Carolinians. Saturday evenings when the trailer pulls up outside Karen Estetica, a Latino hair salon on Sharon Amity, a line forms almost instantly. Carpenters coming off work, a dad and kids enjoying a family outing, young guys in hot cars, beauty salon workers in uniform – nearly all are Latino. Later in the evening in uptown, the Pinchos El Bori trailer is a fixture on the busy bar scene, drawing both Latinos and non-Latinos. “From everywhere,” Medina says happily, “Spanish and American, black and white, from all countries.” It’s a true cultural crossover in this newest New South. 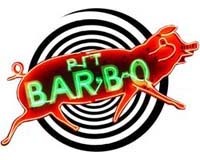 7th and Brevard streets, uptown, Friday and Saturday nights 9:30 p.m. – 3 a.m.
3731 Sharon Amity, just off Central Avenue, Saturday and Sunday evenings 5 p.m. – 9 p.m.